Cliff Mass Weather and Climate Blog: Was Global Warming A Significant Factor in California's Camp Fire? The Answer is Clearly No. Was Global Warming A Significant Factor in California's Camp Fire? The Answer is Clearly No. The Camp Fire that struck the northern California town of Paradise and vicinity is a profoundly disturbing environmental disaster of first magnitude. Nearly 100 people have lost their lives, approximately 10,000 homes have been lost, a major community has essentially been destroyed, and millions of people have been exposed to high concentrations of smoke. Tens of thousands of people have been displaced and lives of millions substantially affected. And beyond the heart-wrenching losses noted above, it is doubly tragic that this disaster was both foreseeable and avoidable, resulting from a series of errors, poor judgment, lack of use of available technology, and poor urban planning. It is more than unfortunate that some politicians, environmental advocacy groups, and activist scientists are attempting to use this tragedy as a tool for their own agenda, make the claim that the Camp Fire was result of global warming. As I will discuss below, this claim has little grounding in fact or science. 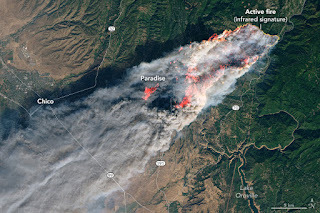 Global warming is a profoundly serious threat to mankind, but it has little impact the Camp Fire and many of the coastal California fires of the past few years (e.g., the Wine Country Fires of October 2017). And blaming global warming takes attention away from the actions needed to prevent such tragedies from happening again. A central causative factor was the strong, offshore-directed, winds that both initiated the fire and drove it rapidly towards the town of Paradise. These winds are known as Diablo winds, and are driven by the difference in pressure between the intermountain interior (e.g., Nevada) and the coast. The easterly (from the east) winds that struck that day were not that unusual, something that is evident by looking at the wind climatology at the nearby Jarbo Gap USDA RAWS weather station. The sustained winds on the day of the fire initiation (November 8) accelerated to 32 mph (with gusts to 52 mph), with peak winds at 4 AM that day. Looking at the entire record at Jarbo (back to 2003), northeasterly winds of 30 mph or more have occurred 508 times in those 15 years--not an unusual event. And my inspection of the individual records does not suggest an increasing trend. Furthermore, there is no reason to expect that Diablo winds will increase under global warming; in fact, the opposite is the case. Global warming preferentially warms the interior of the continent compared to the eastern Pacific. Thus, human-caused warming would tend to weaken the interior high pressure, thus lessening a key driving force of the Diablo winds. There are several studies in the peer-reviewed scientific literature (e.g., this one) that show that global warming should weaken southern California's Santa Ana winds, which are also driven by the pressure difference between the western interior and the coast. There is strong evidence that that Camp Fire was caused by failure of PG&E powerlines, not by any natural causes that could be linked to global warming. In fact, nearly all wildfires in California are caused by human error or arson. Increased population in California would clearly lead to more human fire initiation. Thus, global warming is not a factor in fire initiation. One of the most popular handwaving arguments about why global warming is enhancing wildfires is through temperature and precipitation changes. It is argued that warming temperatures are causing more evaporation and thus drying the "fuels" at the surface. And it is argued that global warming is causing increasing drought that dries fuels and encourages fires. Now this sounds reasonable enough on the surface, but when you examine the facts more closely, it rapidly becomes clear that global warming has little role in producing the dry conditions that assisted the Camp Fire, the wine country fires, or the fires in coastal southern CA. The truth is that California is quite dry during nearly half of the year and that fuels such as grasses, bushes and small vegetation dry out during any typical summer. Even more important, virtually all of the fires noted above (including the Camp Fire) were associated with offshore, downslope winds which rapidly dry out vegetation, even it is wet the day before! The fire weather community divides fuels by how quickly they dry. 1-h fuels are less than 1/4 of an inch in diameter and can dry in LESS THAN AN HOUR. This includes grass and small weeds/plants. 10-h fuels have diameters of 1/4 to 1 inch and dry in less than 10 hours, and include small bushes, branches, and the like. In much of California, and particularly in the areas of the fires noted above, most of the fuels were grasses and small stuff--mainly 1 and 10-h fuels. Thus, they dry very quickly, such as when Diablo winds start to blow. This kind of small diameter fuels is known as chaparral in California, and there was a lot of such ground cover north and east of Paradise. Now let me prove to you that global warming had nothing to do with the dry conditions near Paradise on the morning of November 8. Below is a plot of the ten-hour fuel moisture at the nearby Jarbo Gap observation side, a site that was in the path of the fire, for the five years ending November 20. You will note a repeatable pattern, with values reaching around 27% during the winter, but 3-8% every summer and early fall. The fuels are not getting progressively drier. I should note that I was told by local fire experts that values below approximately 10% are plenty dry enough to burn. Looking at a blow-up image of the fuel moisture of the last 3/4 year you can see the summer drying clearly and something else very important....there are short dry periods even in the middle of winter when rain is falling occasionally. Why? Because there are diablo wind events that can dry out the vegetation even then. The bottom line is that the vegetation is plenty dry enough to burn every summer right now...and has been like that forever. Even if global warming is increasing temperatures a few degrees (and it probably is), IT DOESN'T MATTER. The fuels are plenty dry enough to burn already. That is why the handwaving argument that global warming is contributing to the fires simply don't make sense. And then there is the argument that global warming is somehow decreasing autumn rains in the area. This has little basis in truth. Here is the plot of precipitation form the NOAA/NWS climate division data set for 1930-2018 for August to October precipitation for the area of the Camp Fire. There is no obvious trend. August to October precipitation is typically light (about 2 inches), with lots of variation year to year. Many years are as dry or drier than this year. And the global warming simulations for the end of the century that I have seen do not show a consistent change in fall precipitation. As long as I taking on taking on claims of global warming-fire connections, some folks like to talk about tree deaths, bark beetles, and the like, with the claim that global warming is killing trees and thus leading to fires. The Camp Fire areas is NOT noted for tree death and besides, most of the fire was on chaparral vegetation. Below is a satellite photo showing the boundaries of Paradise (brown line), with the fire starting near Pulga (on the NE side of the image). The fire spread over a region that had been logged, previously burned, and was then mainly grass and small shrubs. In summary, if one analyzes the situation, it is evident that global warming had little to do with the Camp Fire. As I will discuss in a future blog, the Paradise area was a ticking time bomb. There was a huge influx of population into a wildland area, which had burned many times in the past. Previously logging and fires had left a conduit of highly flammable grass and bushes, through which fire could move rapidly. Flammable, non-native invasive grasses had spread through the region. Homes were not built to withstand fire and roadways were inadequate for evacuation. Powerlines started the fires and were not de-energized even though strong winds were skillfully forecast. Warnings to the population were inadequate. The list is long. And global warming should not be on the list if we are to focus on the real problems. What a well thought out and explained piece of analysis. Will not stop the AGW-causes-everything crowd from either ignoring this or not understanding it. Even though I disagree with you about the underlying AGW issue, I have great respect for your integrity and scholarship. In fact, you're one of the very few AGW proponents who I will listen to. If you ever decide to write a book about the issue, I will read it because of your track record of careful, objective scholarship. In addition to power shutoffs, California should institute new statewide guidelines requiring all new planned developments in wooded or wild areas to build fire-resistant homes- stucco walls, tile or metal roofs, metal studs, metal shutters for the windows, and landscape with the less flammable deciduous trees planted well away from the houses. It's even worth considering concrete, rather than asphalt, roads (as I understand it, in some of these fires the road itself burns, which can only happen with asphalt). It might be worth building local underground "fire-shelters" either in the basement of homes or in community centers, much as Kansans have "tornado shelters". Finally, installed outdoor sprinkler systems should be considered as well. I really respect your adherence to evidence based claims on important issues such as those around climate and the environment. Change needs to come from credible observations and assertions based on faulty premises are counter productive. I am wondering though if you concede some fire activity is climate change related. These titles popped up today as references in my reading this am (and I did not seek them out in response to this blog): "Increasing water cycle extremes in California and in relation to ENSO cycle under global warming" (https://www.nature.com/articles/ncomms9657) and "Impact of anthropogenic climate change on wildfire across western US forests" (http://www.pnas.org/content/113/42/11770). As these are sources outside the media and are from decent science journals they raise the above question for me. This is not science I follow and am not informed on where consensus lies within specialists here. But in this time of media questioning I have held onto my general trust of peer reviewed literature in the physical sciences and thus am interested in reconciling what I read here with that sourced elsewhere. I concur that this area has burned "forever." Realistically the real problem is building flammable homes in the region. However, are you actually claiming that the fuel moisture from the fine fuels for the last five years indicate that climate change isn't a factor in these fires? First off, show us some data for the 20th century. The last five years are not an indication of long term "normal conditions." Additionally, the larger fuel classes are what tend to bump up fire intensity, and they are very responsive to a few degree temperature difference, or a bit longer drought. I looked into the average climate data for Paradise, CA. Usually the town averages 6 days of rain and 4 inches of rain in October, and 10 days rain with 7 inches in November. 2018 has seen essentially no rain these months. The Western Regional Climate Center summarized it thusly: "During the first month of what is typically considered the wet season, precipitation was below 75% of normal across southern Oregon, western Nevada, and much of California. San Francisco, California, reported only 0.21 in (5 mm) of rainfall, 19% of normal. 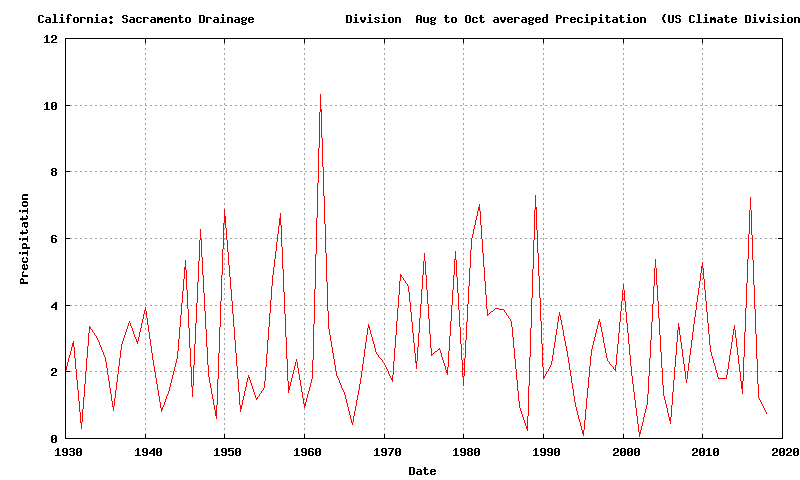 In San Francisco's 170-year record, fourteen Octobers have no measurable rainfall. Further north, Sisters, in central Oregon, reported 0.14 in (4 mm), 13% of normal. Drought conditions persisted, but did not worsen in these areas in the US Drought Monitor." My question is whether when Diablo winds usually strike the region has had at least a bit of rain to raise the moisture content of the vegetation. If climate change is loading the dice towards more drought years, would not the coincidence of exceptionally dry autumns with a strong Diablo winds create a link between some causation of climate change with worsened wildfires? @gnolan, I suggest some skepticism is in order regarding peer review. It's a great idea in theory, but the practice leaves very much to be desired. The article at the link is long but highly informative on the issues surrounding peer review. After a summer of unprecedented high temperatures and a fall “rainy season” with less than half the usual precipitation, the northern firestorm turned a city called Paradise into an inferno within an hour, razing more than ten thousand buildings and killing at least sixty-three people; more than six hundred others are missing. The New Yorker's legendary fact checkers must have been on vacation last week. Thank you for a we'll thoughthought out and evidence based article. However, you have forgotten one important factor: dead and dying forests. Most of the forest in the Paradise area is oak. California oak forests have been decimated by "sudden oak death", a parasite which has been definitively linked to a warming climate. Pine forests in California (and more so in BC and Washington) are dying from bark beetles, which is also linked to climate change. All of your points may be correct, but you have overlooked the (new) abundance of dry fuel in the form of dying and dead trees. Forgive any typos - the was typed on a phone. My bad for not reading your post in it's entirety. Chalk it up to the delivery method - my cell phone. I still think it's a reckless to definitively state the climate change had nothing to do with the Camp fire. Was climate change THE CAUSE? Certainly not, as you point out. Was it a contributing factor? Almost certainly. Will climate change contribute to future fires? I'm afraid so. Gov Brown is talking out of both sides of his mouth. He has to RESIST Trump and any anti-catastrophic climate change language, but more privately, he knows where the real problems exist and what needs to be done. Months before the Camp Fire he tried to begin to do something. This story is from August. "Was it a contributing factor? Almost certainly." There is no factual evidence for this claim, it's merely a subjective argument. Calling Cliff's analysis "reckless" is exactly the kind of overwrought and dramatic statement that has no use in actual scientific analysis. president tumip is correct "let's america rake again." he heard that from finland. Will you include in your blogs when an occurrence/situation/etc that you determine is not climate change but resembles what it is expected to be like. Also, a blog on where in the world you see climate change happening right now. Thank you Cliff... get ready for the insults from people who can't even name 6 native plants but think they're experts on climate and wildfires lol. He said that global warming wasn't a significant factor, not that it had nothing to do with the Camp Fire. Granted, significant maybe wasn't the best word choice - especially for someone with Cliff's level of familiarity with statistics. Can you elucidate your conjecture regarding the contribution of global warming to the fire(s)? "Almost certainly" makes it seem like you must have the inside scoop on some pretty solid evidence regarding this specific event - evidence that, apparently, is inaccessible to Dr. Mass. The media has whipped the average progressive in to such a state of fear regarding climate change that they see climate bogeymen in any and all severe weather events. Even when as in the case of fire, weather alone is not enough to initiate the event. Your analysis is always appreciated Cliff. Your data analysis & perspective are much appreciated! As a resident of Washington state, I look forward to your blog updates and have learned a lot from you. Please keep up the good work and I hope to meet you face-to-face someday! Has anyone mentioned that theses fires are almost all human caused? During the fall and the Diablo conditions, there are no lightning storms in California. So without the large influx of people to the hills and outlying areas, the chance of such fires is extremely low. Global warming cannot be the cause as "warming" stopped perhaps twenty years ago now. Mother Earth has actually been in bit of a cooling phase since 2015. And there is more cooling to come as the major source of climate change, the sun, is the quietest it has been in about a century. The challenge among those who are monitoring the cooling trend is how much cooling will happen. Forecasts range from another half-degree drop to as much as a five degree drop. We could be headed into a mini-ice-age much like that of the 1800's. Dr. Mass, your data are compelling and rigorous. I have to wonder, however, how you account for the sheer length of the fire season in California. While any individual fire is not caused by climate chaos, the fact that the fire season is now practically year-round (as reported by the firefighters, who should probably know) must be accounted for somehow. If nothing else, the expense and energy required to fight the fires is sucking up the budget and personnel required for proper forest management that could mitigate such fires. This is certainly true at the Federal level; it may also be true at the California state level, too. Maybe, we should go back and take a look at controlled burns,like the Native Americans,and practice how they manged the forest. Your blog is well-reasoned and scientifically sound. Two questions remain. What actions could have prevented the fire, other than de-energizing the high tension transmission line? Could very early use of multiple KC130 tankers have snuffed out the fire before it became unstoppable? What is the scientific consensus on this particular topic? Being a non-scientist, I tend to use probabilities to inform my opinion. In modern times, If 97% of the scientists concur on a scientific theory, it seems like probability would favor the 97% being correct as opposed to the 3%. I think it's called deductive reasoning. I saw the news today with people bustling about in their planes and trains of cars going nowhere. I wonder what the total carbon footprint will be for this holiday travel season here in the US? '...how you account for the sheer length of the fire season in California.?' This is the essential question, and what separates Weathermen from Climate Scientists such a Jim Hansen. One set thinks of weather, the other studies climate; very different enquiries. One group thinks globally. The other jabbers on TV. Let us hope this rakes progress does not end in Bedlam too. Can you show us the data that shows that the frequency of November fires in Northern California hasn’t changed over the last 50 years? We've had fires for a very very long time. Fire ignition is not unusual at all. Wildfire starts, both natural and human-started, have been common since at least the early 20th century. What's different: fuel reduction is WAY down. 80% reduction in the last 50 years. California has refused to do fire mitigation. California provides very little mitigation support to landowners, and generally makes the task difficult rather than easy. - Statewide, an *increase* to 50k acres a year of prescribed burns, vs many hundreds of thousands of acres annually in much smaller states. - Landowners must own 20+ acres to have access to a professional forester who will visit and provide mitigation training. - Senate environmental strategy team denied access to Cap & Trade funds for mitigation in April 2018, claiming that even though fire is by far the largest CO2 source, to do this would detract from the [political] message that climate change is due to human influence. - We are VERY vocal about the fact that fire mitigation is all about fuel. Not eliminating the sparks that start fires. A classic case of human beings wanting to blame something other than their own irresponsibility. Thanks for the insights. We own 160 acres of forest that was partially burnt in 2002, in a fire that was caused by a government helicopter clipping some power lines, the helicopter had been searching for illegal marijuana farms in the area. That fire burnt 400,000 acres of forest, and we lost about 20 acres. What I noticed when I was trying to help fight the fire on our land, was that the prisoners they sent out to fight the fires were not making much difference. The airplanes they used would not fly at night, so any progress they made during the day, was lost overnight. They set a backfire which worked, but in the process, they burnt down 20 acres of our land. But that was after very many houses were lost, and 400,000 acres were destroyed. Last week in Fallbrook they caught an arsonist who started a fire while the Camp fire was still burning, and they quickly set him free. The government is woefully inadequate against the wildfire problem, and they probably will remain that way while most of the forest is lost. Drones and remote controlled bull dozers could be used to fight fires, but it would take a large commitment which probably won't happen. Instead we have a high speed train to the desert partially complete, and we are building houses for the hobos. I wouldn't say its mismanagement, I would say its criminal negligence done by a corrupt and ignorant government, failed leadership, and a lack of accountability. It doesn't matter whether we have global warming, CA will destroy its environment long before Global Warming is a problem, due to its negligence. If this prediction is true, then it won't matter whether or not the IPCC's claims are borne out. AGW will be but a distant memory. 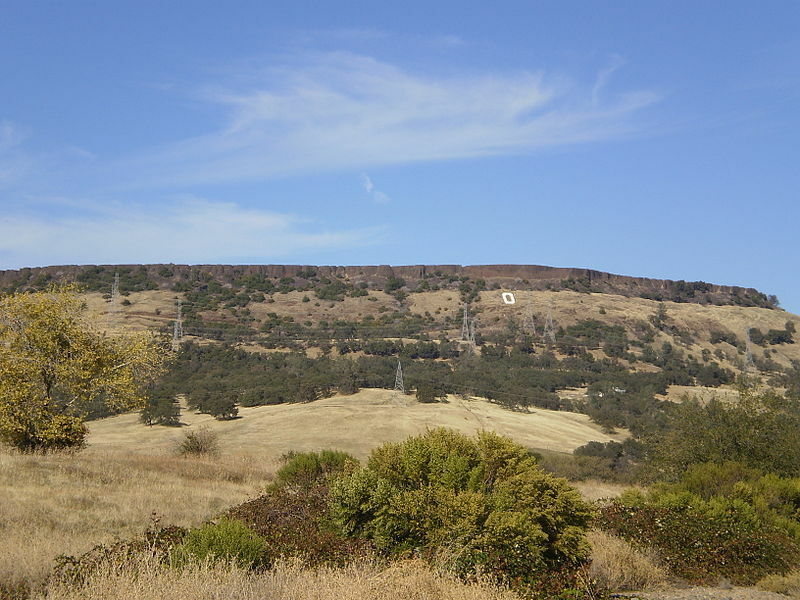 "In addition to power shutoffs, California should institute new statewide guidelines requiring all new planned developments in wooded or wild areas to build fire-resistant homes- stucco walls, tile or metal roofs, metal studs, metal shutters for the windows, and landscape with the less flammable deciduous trees planted well away from the houses. It's even worth considering concrete, rather than asphalt, roads (as I understand it, in some of these fires the road itself burns, which can only happen with asphalt). It might be worth building local underground "fire-shelters" either in the basement of homes or in community centers, much as Kansans have "tornado shelters". Finally, installed outdoor sprinkler systems should be considered as well." I took a quick glance at the Paradise area on Google and it looks like Paradise is a suburban community set inside a ponderosa forest. Why is this important? I've seen many photographs of the fire's aftermath and it looks like the ponderosas actually withstood the fire better than the structures in the immediate vicinity. This makes sense considering ponderosa pines have evolved in an ecosystem where fire is a common recurrence and have evolved to be somewhat more fire-resistant than the typical deciduous tree. It might be time to consider buffer zones of stripped vegetation around populous communities. Here is how Oregon state law addressed the issue wildfire. If the same laws existed in Washington state I would have a legal basis to compel our HOA Board to enforce our protective and restrictive covenants which require landowners to maintain their Lots for safety. I addressed this issue with the HOA Board and was flat out told by the board president that she would never enforce that Covenant. My goal of course is significant fuel load reductions in that development beyond the 2% which is currently the plan. Some lot owners are not participating in the plan, and 2% is not a significant fuel reduction anyway. The excess fuel load offers privacy and the beauty of the forest right up to their doorsteps. But they're not here most of the time as the development is mostly vacation homes. They will still have a place to live if their vacation home burns down. Unfortunately by not enforcing the Covenants, the HOA Board president is opening up the HOA members to liability issues as well as placing public health and Safety at increased risk of harm. There are reasons why these developments situated in wildland-urban interface burn so completely. 3 decades from now, when even then the contribution of a warming planet will likely (hopefully) still be small compared to other factors, will you still be saying " Oh look, there go the Liberals again, barking up the wrong tree". So what is that significance of that tiny contribution, in a context of your stated belief that "Global warming is a profoundly serious threat to mankind"? You are in a position to elucidate this subtle but profoundly significant link but to my knowledge, this has never happened. Yes their barking is perhaps riddled with errors but no - the actual tree they are barking up is the right tree. It is not enough to just tell the dogs "your barking is in error". You are in a position of skill and influence to provide the tools and technique that the dogs currently lack. When are you going to start doing it? I wonder if there are any "ticking time bombs" of a similar nature to Paradise that we need to be aware of in the Pacific Northwest? The signal for climate change in forest fire incidence in California is the increasing frequency of fires in what previously was the off season for that particular part of the state. The data that Cliff presented obscures the shoulder effect of more frequent red flag conditions in late October through December, when in previous decades fires were more rare in Northern California. So while Cliff is technically correct in saying that you can’t blame the paradise fire on climate change, just a few decades ago when conditions in November were wetter and cooler the fire would have been less likely to start and if started, not as likely to have moved so quickly through the brush to the towns. When others keep screaming at Cliff to start ignoring his own conclusions and instead start agreeing with their dogmatic outlooks is when true scientific inquiry dies. If you don't care for his conclusions there are thousands of other sites mindlessly parroting their overlord's memes of the day. If you have to continuously browbeat anyone disagreeing with your worldview you only expose your own insecurity and lack of faith in your beliefs. Mr. Mass, your graphic does indeed indicate a trend, in my opinion. Note the high ~1955 and draw a line to the most recent high. It sure appears to me the trend is down. There are one or two "spikes" but even those are down from that '55 high. The graphic is limited, however, since a century of statistics is small in the whole scheme of climate discussion. It is hard to fear something (global warming) that will have major impact on our lives someday. For some communities, the effects have already started. It doesn't seem like there has been a big impact on the PNW yet (though our summers sure do feel warmer). So, every time something like this happens, I quickly jump on my own: is this it? Is it starting? Is it fair to fear global warming will make large fires like this more common and/or larger in the future, even if not in the near future? If so, one could say while this fire was not caused by global warming, these are the kinds of events that will plauge us if we don't act on global warming. I'm also curious if there are any disasters that you see as partly caused by global warming? What does the data look like when global warming is partly to blame? Seattle "progressives" are smarter than everyone else; we know this because they constantly remind us of it. So, given their superiority, wouldn't you think that the "progressives" who grace us with their intellects would compare forest fire frequency in public forests to private ones and think about using some of the management practices of private forests in public ones? Nah, that would be way too smart. Oh well! Michael Leggett - if you read the past voluminous postings by Dr. Mass on your question, you'll have your answer. Asking the same question over and over will not likely lead to a different result. I'm not a "progressive" but I am an ecologist. My field is fisheries, but I have a degree and training in forestry. You are correct that there is a lower incidence of high intensity/severity wildfire on private timber land as compared to public forest land. But there are many dimensions on which we can compare private and public forest land. For example, biodiversity is lower on average on private timber land. By both federal and state law, public lands must be managed for multiple uses, including protection of habitat for endangered species. Courts have found that those laws precludes the kind of intensive management typical on private lands. So unless Congress changes the laws for federal lands, or the relevant State legislatures change the laws for state lands, we cannot clear-cut our way to lower incidence of wildfire. Please note that I am not making a values judgement here. I am merely stating the facts of the law and the science regarding forest management and biodiversity. I am not saying we "should" or "should not" manage our public lands as we manage private timberland. The science has shown that intensive management reduces critical habitat for certain species. Congress has decided through laws such as the Endangered Species Act that we should protect those habitats. There is strong evidence that that Camp Fire was caused by failure of PG&E powerlines, not by any natural causes that could be linked to global warming. In fact, nearly all wildfires in California are caused by human error or arson. Increased population in California would clearly lead to more human fire initiation. Thus, global warming is not a factor in fire initiation." Cliff, while I greatly appreciate your viewpoints and scientific analysis, I highly suggest you consult the folks over at the UW's Department of Urban Design and Planning. Specifically, you should look over their IPM 505: Climate Change & Infrastructure class and IPM 506: Energy Systems. Increased wildland fires, due to sagging powerlines in heat, overheating of transformers from higher average daily and nightly temperaures and related causes are well documented and predicted to occur more often. Considering roughly 4/5ths of California's wildland fires over the past few years are now cased by failing electrical infrastructure, this is a highly prescient issue, and one you should consult with your peers at the University. You need to brush up on your Aristotle. Climate change is not THE cause of the Camp Fire, but it is A cause. 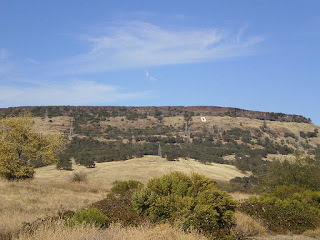 You are correct the the final cause of the Camp Fire were power lines and Diablo winds. Just as the typical mediterran climate of California is a formal cause. But climate change, in so far as it contributed to the increased provabolity of drought and more extreme hot days during the summer, is at least an efficient cause. You are correct that there is a lower incidence of high intensity/severity wildfire on private timber land as compared to public forest land. But there are many dimensions on which we can compare private and public forest land. For example, biodiversity is lower on average on private timber land. In other words, you prefer to let it burn, because you're too smart to ever once consider facts you don't like. As I have said in the past: "You always tell a Seattle 'progressive,' but you can never, ever tell a Seattle 'progressive' a single thing." Has it occurred to you that your "biodiversity" ain't worth squat if the forest burns? Nope, not at all. Only we inferior stupids seem to be able to figure that one out. Ideal for increasing growth of grasses and shrubs.....larger fuel load. The trends for the PNW are similar. Wetter, warmer spring months producing more vegetation (fuel load), followed by warmer, drier summer months. As a long time resident of Southern California, this analysis seems right on to me. Santa Ana fueled fires have been part of the SoCal landscape as long as I can remember going back to the Bel-Air fire of 1961. There were almost identical Santa Ana fires blowing from Agoura to the ocean in Malibu in late October 1978 and early November 1993. 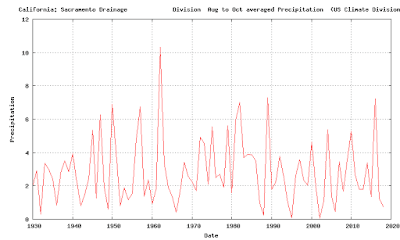 Both 1977-78 and 1992-93 were rainy winters. I recall thinking the ensuing autumns were dangerous fire seasons because there was more fuel. We have 4-5 months of almost no rain so everything is dry by August no matter how wet the prior winter was. I also believe the Santa Ana winds are less frequent in SoCal than 40-50 years ago. We have more heat waves without the wind now. I do not recall fires being so frequent in Northern California, nor in the forests of British Columbia and the interior Northwest, but perhaps I was not paying attention as I did not live in or travel to those areas back then. As a non-expert, my interpretation is that the die for CA forest fires becomes more loaded with climate change as the long term forecast is for higher temps. This also fits with Eric Holtaus's piece at Grist, where he quotes local meterologist, Rob Elvington's tweet of a 99+% ERC (energy release component) for the area on 11/08/18. In any case, I'm looking forward to Cliff's follow-up piece on why climate change shouldn't be on the list of things to worry about to prevent future fires like the Camp Fire. Why shouldn't predictive factors like climate change be on that list if they alert us that forest fires will become more frequent in the years ahead? Thank You for tying your analysis to data. As a retired engineer it frustrates me to listen to claims that are not visibly supported by data. While I agree with your conclusions I have a unconventional position on the solution. I believe that we need to augment our prevention efforts with a dramatic change in our fire attack strategy. Regardless of the cause, megafires are getting more common and we need a strategy to deal with this new reality. A summary of which can be seen in this Op-ed I published recently. Furthermore when the NWS issues a red flag warning to warn people about approaching fire WEATHER the temperature variable they look at is maximum temperature. However as the USHCN data shows and Mao (2015) report "daily maximum T (Tmax) shows no trend in either season"
There is simply no evidence to support a link to global warming! Jim Steele - Yes all so true but while it serves to illuminate the risk factors for today, we all know that Global Warming is a exponentially rising risk of the future, right now being the thin edge of the wedge At this point the more or less truth of the statement "There is simply no evidence to support a link to global warming!" has been flogged to death. Even the majority of the MSM headline writers will point out that buried in the actual news articles is abundant text devoted to saying exactly that, if one only would read it. Cliff won't do it but it could be highly educational if you would step up to the plate, professional forest ecologist that you are, and put the tiny climate change signal that does exist ( or doesn't at all by your above statement) in a context of what it means for the future. In other words, what import can be ascribed to such a teenie tiny thing such as for instance "a mere 2 degrees of warming" or any number of apparently inconsequential changes to our future. USGCRP, 2018: Impacts, Risks, and Adaptation in the United States: Fourth National Climate Assessment, Volume II [Reidmiller, D.R., C.W. Avery, D.R. Easterling, K.E. Kunkel, K.L.M. Lewis, T.K. Maycock, and B.C. Stewart (eds.)]. U.S. Global Change Research Program, Washington, DC, USA. doi: 10.7930/NCA4.2018. Of course we could rely on President Trump and other climate change deniers who frequent this blog for an assessment of this issue. Grist is, always has been, and always will be a joke. If you want to discuss environmental subjects intelligently and persuasively, find different sources. which has a plot showing a direct link between Forest Fire Area Burn and fuel aridity with a conclusion that fire increase is 75% due to increased aridity. Could you explain why they are wrong and discuss the different method they use to measure aridity? Ditto for a chart from Carbon Brief showing a correlation between area burned and temperature: Red bars show western US forest area burned (in thousand hectares) using data provided to Carbon Brief by Prof John Abatzoglou, updated from the data used in Abatzoglou and Williams 2016. Black line shows March-August temperature anomalies relative to a 1961-1990 baseline period for the US west of 102 degrees longitude using data from NOAA; Chart by Carbon Brief using Highcharts. "The Abatzoglou and Williams paper is not relevant to the Camp, Wine Country and coastal fires--which are mainly grass and chaparall and not forests. The Four Assessment section on wildfires is very weak....I will do a blog on it in the future...cliff"
If it is so weak, how about a peer-reviewed scientific publication? MAC - stop using Holocaust denier language in your attempts to smear those who don't agree with your worldview. It's pathetic. Only the heavy hand of government can reduce America's GHG emissions as fast as climate activists now demand. Here is a plan to reduce our GHG emissions 80% by 2050 using the existing legal authorities of the President as enabled by the Clean Air Act and by existing national security legislation. -- File and win lawsuits to allow regulation of CO2 and other carbon GHG's as pollutants under the Clean Air Act. -- Publish a CAA Section 202 Endangerment Finding as a prototype test case for regulation of carbon GHG's. -- Defend the Section 202 Endangerment Finding in the courts. -- Issue a presidential executive order declaring a carbon pollution emergency. -- Publish a CAA Section 108 Endangerment Finding which complements 2009's Section 202 finding. -- Establish a National Ambient Air Quality Standard (NAAQS) for carbon pollution. -- Use the NAAQS for carbon pollution as America's tie-in to international climate change agreements. -- Defend the Section 108 Endangerment Finding and the NAAQS in the courts. -- Publish a regulatory framework for carbon pollution under Clean Air Act sections 108, 111, and 202. -- Establish cooperative agreements with the states to enforce the EPA's anti-carbon regulations. -- Establish a system of carbon pollution fines which is the functional equivalent of a legislated tax on carbon. -- Establish the legal basis for assigning all revenues collected from carbon pollution fines to the states. -- Research and publish a provisional system of direct carbon fuel rationing as a backup to the carbon fine system. -- Defend the EPA's comprehensive system of carbon pollution regulations in the courts. -- Commence operation of prior agreements with the states for enforcement of the EPA's anti-carbon regulations. -- Commence the collection of carbon pollution fines and the distribution of fine revenues to the states. -- Monitor the effectiveness of the carbon regulatory framework in reducing America's GHG emissions. -- Adjust the schedule of carbon pollution fines upward if progress in reducing America's GHG emissions lags. -- Assess the possible need for invoking the provisional system of direct carbon fuel rationing. -- Defend the EPA's system of carbon pollution regulations against emerging lawsuits. -- Issue a presidential proclamation declaring that Phase IV anti-carbon measures cannot meet the 80% by 2050 target. -- Initiate the provisionally established system for imposing direct government control over production and distribution of all carbon fuels. -- Apply the Phase IV system of carbon pollution fines in escalating steps as needed to incentivize Phase V compliance. -- Defend the government-mandated carbon fuel rationing program in the courts. -- Assess the need for continuing the EPA's anti-carbon regulations and the US Government's mandatory fuel rationing program beyond 2050. -- Defend the government's anti-carbon measures against emerging lawsuits if these measures continue beyond 2050. Remarks: Phase I of this plan was complete in 2012. The legal foundation needed to impose aggressive across-the-board regulation of all major sources of America’s carbon emissions remains in place awaiting the appearance of a president willing to use it. Eric Blair said, "if you read the past voluminous postings by Dr. Mass on your question, you'll have your answer. Asking the same question over and over will not likely lead to a different result." I'm not sure what Eric meant by "asking the same question over and over" as that was the first time I've commented on Dr. Mass' blog and I didn't repeat my questions. As for reading past posts, I have read much of Dr. Mass' writing but not all of it and I was unable to search his blog to answer my questions easily on mobile (search is only shown on desktop). (1) Is it fair to fear global warming will make large fires like this more common and/or larger in the future, even if not in the near future? If so, one could say while this fire was not caused by global warming, these are the kinds of events that will plague us if we don't act on global warming. Dr. Mass talks about this here. Summary: Yes anthropogenic global warming is a contributor to Washington area fires now but a small one (he estimates that it is probably less than a 20%). Dr. Mass encourages attention to be paid to the greater causes of current fires. He also wrote that in the future, as temperatures warm profoundly (particularly during the second half of the century), the influence of human-produced global warming on our wildfires will clearly increase substantially. (2) I'm also curious if there are any disasters that you see as partly caused by global warming? What does the data look like when global warming is partly to blame? Dr. Mass addresses this question in this post and in this post from 2017. "MAC - stop using Holocaust denier language in your attempts to smear those who don't agree with your worldview. It's pathetic." Cliff, I agree with you that factors not related to AGW were to blame for the Camp fire. "And global warming should not be on the list if we are to focus on the real problems"
Unfortunately that is the soundbite that is being picked up my media around the globe. It's how I got directed to your blog. You really should be more careful with your language. Global Warming *is* a real problem, and I do not believe based on a couple short term charts you can summarily dismiss *any* connection of AGW to the CA fires. As a slight aside, it is becoming increasingly apparent that it is nearly pointless to argue science with any denialist who has a degree in science. If you have ever tried you would know why. It also seems to me to be increasingly pointless to 'depoliticize' climate change. Much too late for that. Read the comments from Trump supporters who proudly point to your conclusions and you will see why. At this point, probably the only way we can make progress in dealing with the problems associated with Climate change is through political change--crushing defeats at the polls for those who deny science. Ironically, you argue that manmade causes (logging, population increase, human-started fires) were the cause here, and yet that falls on deaf ears to those who believe man is incapable of influencing our climate. They only hear that it is *not* AGW and that becomes their mantra. MAC raises some pertinent observations, all to do with a thing that is called "the consensus". While some people will flippantly dismiss a 95% expert consensus opinion as merely a "world view" or "group think" or that "science isn't consensus" , I supremely doubt that they would happily agree anymore than anyone else to any surgery procedure if they knew that it didn't have the confidence of a consensus of surgeons. So obviously there is actually some significant import attached to this term "the consensus". What exactly is its purpose? What use is it? If it does have a significant and substantial role in decision making, why are some people so hostile to it? Just another one of those topics that Cliff Mass could actually provide some sort of skilled insight to, rather than just repeating year after year the same old dreary complaint about hypocritical liberals in petroleum product kayaks and hyperbolic caffeine crazed headline writers. Michael Leggett … nice response re your questions and Prof Mass's responses. "Brutal and Extended Cold Blast could shatter ALL RECORDS - Whatever happened to Global Warming?" "One of the problems that a lot of people like myself, we have very high levels of intelligence but we're not necessarily such believers." "As to whether or not it's man-made and whether or not the effects that you’re talking about are there, I don’t see it"
Mac - I asked you specifically to stop using Holocaust language in attempts to smear others. Rather than face up to your smear, you attempted to deflect it via strawman arguments. Pathetic and infantile. Try harder next time. Yes, the earth is warming. It has so, with spits, dips and spots for the past 10,000 years when our ancestors began to clear cut forests--trees are the carbon bank--for agriculture, villages, timber, etc. Beyond volcanic and asteroid / comet impacts, the mini Ice Age 500 years ago what do we have? We have an 800+ page Climate Special Report published by IPCC with a major math error, which reduces the end of the world scenarios to mere hype. Worse, IMO, is that in all of those pages of chapter reports, FAQs, summaries, conclusions, 6000 scientific citations, 10 lead authors, 14 contributing authors, 4 editors they leave out two critical items in their climate modeling. First, nowhere in the above can one find the word "sunspot." How does a climate model leave out the sun's output and solar activity, which clearly impacts the earth's climate and, recently discovered, the same solar flare are the driving force behind hurricanes size, randomness and absence from one year to the next? Second, IPCC report leaves out "Solar Minimum," yes related to sunspots as solar scientists have concluded that the earth is going into a 40 year cycle of hibernation, or global cooling. No one can predict this effect until we see how it plays out. But not to have a best case and worse case scenarios is plain wrong. Can't leave out a major factor of a climate analysis and call the study complete. On the California fires. Yes, Gov. Brown is selling his view or the consensus view of Climate Change, caused by manmade CO2. But a deeper look it appears that California hyper-localized responses to climate change is the main culprit to the aridity of the forests and why homes and manmade materials burn over flammable organic matter. Here's one study that pulls the veil off California's Solar Radiation (mis)Management program, ongoing for the past 20 years. Now throw in the clusters of 5G antennas and 4G cell tower networks and in that environment a microwave effect takes place, sparking and cooking the aluminum oxide coatings on most construction materials facing the elements. It is amusing that so many posters seem to be upset when all the evidence shows no support to attribute global warming to the horrific Camp fire. The important issues to save lives and educate public about fire safety is to discuss how to reduce human ignitions that cause over 95% of the fires. And how fire suppression in some ecosystems can cause hotter more extensive fires and the need to create defensible spaces. Or how invasive grasses like cheatgrass promotes more ignitions, act as a fuse directing small fires into denser habitats to make bigger fires and that those grasses can become bone dry in just 24 hours. Its fire weather not fire climate that is crucial to understand. Despite all the scientific evidence that there is no connection between climate change and the rash of California fires, some posters hate to see a chance for climate fear-mongering regards another catastrophe go to waste. So they stray off topic suggesting we must accept the untested assumptions that CO2 warming must be exacerbating other catastrophes. Instead of discussing the evidence, those who politicize climate science make references to stupid things Trump says evoke the mythical 97% consensus. We all agree climate is indeed changing. CO2 is a greenhouse gas at unprecedented levels. But any purported 97% consensus STOPS there. As the scientific literature reveals our climate sensitivity to CO2 ranges from 1 to 5 degrees for a CO2 doubling. Feedbacks and clouds can offset any CO2 warming. Remember, the ONLY "evidence" that CO2 is causing climate change is models. When a few climate scientists compare their models of natural climate change to models forced by added CO2, then only when they add CO2 do they simulate recent warming where models of natural climate fail to do so. That assumes models of natural climate change are an accurate benchmark, but clearly that is a bogus assumption. Although tuned models do simulate recent warming of the global average, those models do a horrendous job simulating pre-1970s change. Those models fail to simulate the extreme North American droughts in the 30s and 50s. They fail to simulate accelerated sea level rise greater than today during the 30s and 40s. CO2 driven models fail to simulate the warming and lost sea ice in the Arctic in the 30s and the rapid warming of Greenland, far more rapid than any more recent warming trends. Those model failures lie in their inability to simulate natural oscillations, as most modelers admit. The Pacific Decadal Oscillation was not named until ~1997 after modelers had tuned their models to rising CO2. But researchers (Johnstone 2015) recently show the PDO can explain all the 20th century regional climate change around the north east Pacific. Indeed there are many papers showing that the negative PDO and La Ninas cause drier weather and promote more fires. That's why fires are a natural way of life in the western USA and why so many plant species evolved fire adaptations. There are hundreds of papers showing the increasing encroachment of cheat grass promotes more fires. There are thousands of papers showing fire suppression eventually promotes bigger more intense fires. We can easily spot those who wish to politicize wildfires and climate change. They eagerly turn science on its head by suggesting every catastrophe is "evidence" of CO2 driven climate change, while ignoring all the evidence that CO2 warming was not a significant factor. Despite all the evidence, they relentlessly denigrate the scientific process and try to marginalize all that dare to present the conflicting evidence as deniers. They want us to blindly accept that all catastrophes must be at least exacerbated by rising CO2. And their last refuge is not in the scientific evidence, but in parroting the mythical 97% consensus . http://landscapesandcycles.net/97--climate-consensus-is-fake-news.html . I will flippantly dismiss it as a blatant lie. The fact that Bruce and his fellow cultists keep repeating the lie doesn't make it true. I've hiked through an area in Central Oregon that was devastated by the B&B Complex fire in 2003. A native plant called Snowbrush (Ceanothus Velutinus) now blankets miles and miles of what used to be forest. It's head high and extremely dense. "The fruit is a three-lobed capsule a few millimeters long which snaps open explosively to expel the three seeds onto the soil, where they may remain in a buried seed bank for well over 200 years before sprouting. The seed is coated in a very hard outer layer that must be scarified, generally by wildfire, before it can germinate." It's leaves are coated with a substance that burns hot and easily, and, BTW, is part of the chaparral found in Northern California. As nearly as I can determine, Larry Kummer, the author of this analysis, is/was a "consultant" in the financial services industry with no background or credentials in climate science or science at all. His website says that he sometimes posts climate change material on a website run by Judith Curry, Professor of Atmospheric Science at Georgia Institute of Technology. Dr. Curry left Georgia Tech in 2017, apparently as a result of ongoing disagreements with her colleagues on the subject of climate change. Those who argue for anthropogenic climate change as exacerbating wildfires the go to paper is often the 2015 Abatzogloua paper "Impact of anthropogenic climate change on wildfire across western US forests". But there are several problems with their analysis which precludes it from shedding any light on anthropogenic changes and the Camp fire. First as Cliff has mentioned, it deals with forests and dryness of logs that are 100 to 1000 hour fuels, so named because warm dry winds can reduce their moisture content by 63% within that time span. However anyone who has built a campfire realizes, you dont start a fire by igniting a log. You start with small kindling, or what fire ecologists call the fine fuels that are 1 to 10 hour fuels. It is those fuels that are starting our wildfires. Abatzogloua states " observed warming and drying have significantly increased fire-season fuel aridity, fostering a more favorable fire environment across forested systems. We demonstrate that human-caused climate change caused over half of the documented increases in fuel aridity since the 1970s and doubled the cumulative forest fire area since 1984." A short term analysis of increased anthropogenic aridity is confounded by the fact that that the 80s and 90s were positive PDO years with more El Ninos followed by a drying as the PDO turned negative. The western USA endured far more drought in the 30s and 50s before CO2 played a role, and CO2 driven models fail to simulate those drought years further suggesting no CO2 role. wildfire potential across western US forests in the coming decades"
Jim Steele - thank you for your reply to my considerate request of you but I couldn't help but notice that you address it not even remotely, choosing instead to carry on with the well flogged dead horse that you seem obsessed with. OK If you like I can play along but I assume you will reciprocate eventually and reread my request and follow through. 1) "We can easily spot those who wish to politicize wildfires and climate change. " This is a mischaracterization. mostly we want clarification on the ASSOCIATION of wildfire and climate change, specifically the importance to future risks of teeny tiny or even non existent causes that we see now. 2) " They eagerly turn science on its head by suggesting every catastrophe is "evidence" of CO2 driven climate change, while ignoring all the evidence that CO2 warming was not a significant factor." Ummm..... no. Please see above. 3)" Despite all the evidence, they relentlessly denigrate the scientific process and try to marginalize all that dare to present the conflicting evidence as deniers." No again. We are more than happy (especially me, I love my internal combustion engines!) to "follow" the science, not denigrate it, to wherever it leads but we do recognize that true expertise as representative of a consensus of their peers will best identify "the science", not just whoever pounds the table harder. And just to be clear for Eric Blair particularly, denialism is an actual observable human behaviour, one that is often recognizable in those who reject the expert consensus on the matter, in favour of those who pound the table the hardest. Please refer to the expert consensus of human psychology on this matter. thats right! A consensus of expert opinion, not whatever "sounds about right to me". OK, now your turn. Please direct your considerable expertise to explaining how and why such a tiny contribution to wildfires by present day climate change might be significant. in a context of future risk not now risk. Ah yes, not in the cult priesthood, and there for the cult denialists will dismiss them. What makes you think I was responding to you? Knowing the "dead horses" you always drag to this blog, I dont always read your posts unless I see you are addressing me specifically. Such meaningless rebuttals is why I dont waste much time with you. Ive read thousands of peer-reviewed climate papers, there is no consensus. People in the Antarctica research community admit they are split 50-50 on whether or not there is any evidence of Co2 warming affecting Antarctica! You can tell a researchers beliefs by their models. Here is an illustration of the consensus and its contrast with reality . "Advances in dynamical modeling and the use of hybrid methods have improved drought prediction, but challenges still remain to improve the accuracy of drought forecasting." "Even if global warming is increasing temperatures a few degrees (and it probably is), IT DOESN'T MATTER." Really? The hottest summer on record is only a few degrees warmer than an average summer. No difference in fire danger? According to Wikipedia, the largest modern wildfire in California history (since 1932) was this year's Mendocino Complex. It started in July. Only 2.9 C above the long term average, but who knows, maybe a small change can make a BIG difference? I am not sure what you are trying to argue. Indeed models are a work in progress. All I argue is we cannot trust their catastrophic predictions until the models can reliably simulate known past climates. You say "Only 2.9 C above the long term average, but who knows, maybe a small change can make a BIG difference?" The short answer is extremely unlikely! To get a perspective on your question, lets consider a general ignition temperature for a "fine fuel" . Paper has been measured to auto-ignite at 425F. Lets say hot summer days where are more susceptible to fires average 90F. Thus ambient summer temperatures contribute about 21.2 % of the temperature needed to ignite paper. Now consider a 2 degree increase in the global average of hot summer temperatures to 92 F. That climate change increase means the summer temperature now accounts for 21.64 % of the temperature needed to ignite paper. So all the alarmists can safely argue is global warming has added 0.5% of the need heat to start a fire in the most combustible fine fuels. Ambient summer temperature highs only provide 21% of needed temperatures. Ignitions add 78% of the needed temperature to ignite a fire. Global warming, whether natural or anthropogenic only contributes 0.5%. Considering that Ignitions start 85-95% of all recent ignitions, and considering that fine fuels like grasses and twigs can lose 63% of its moisture in an hour of dry winds and 98% of their moisture in 4 hours, it is clear ignitions are the problem. Rapid drying fine fuels in less than a day indicates fire danger depends on fire weather NOT fire climate change. The effects of climate change are minuscule contributors that only the most obsessed alarmist would embrace. I agreed with Cliff that a few degrees warming shouldn't make much difference to wildfires. Your argument seems reasonable as well. On a whim, though, I looked up the temperature during the month of California's biggest fire. All time record high for T-max. Goes back to 1895. Not sure how you and Cliff can dismiss those observations as coincidence - at least without a little more research. "However as the USHCN data shows and Mao (2015) report "daily maximum T (Tmax) shows no trend in either season"
area shows no trend for T-max? Why I am so concerned about this post? After all, Dr. Mass stated that “[g]lobal warming is a profoundly serious threat to mankind.” Ironically, this statement has caused him to be criticized by some global warming skeptics, even as they accept the remainder. Camp Fire started on November 8 and was 100% contained on November 25. On November 20, the date of the post, the fire was still underway, although considerable progress at containment had been made. It is extremely difficult for me to understand how such sweeping statements could reasonably be made even before the event was complete and prior to the careful gathering and analysis of relevant data. One thing that has become clear to me is the subject of global warming is a complex one and that a very high percentage of professional scientists who conduct and publish peer-reviewed research in this area take great pains in their data gathering and analysis. Much of the research in this field has been aimed at controlling for factors that can distort or bias the reported results. Global warming research is almost always done in collaboration with qualified colleagues and the publication of global warming research always requires a critical review and assessment by peers. This approach is at the heart of almost all scientific research published in established journals, including what is done with respect to global warming. I know that Dr. Mass understands all of this even if a number of commenters on this blog do not or do not care. So, it is very difficult for me to understand how he could draw such unequivocal conclusions while knowing that he will be widely cited by those who do not accept that global warming is caused by humans and is a serious problem. In this post, he stated “some politicians, environmental advocacy groups, and activist scientists are attempting to use this tragedy as a tool for their own agenda.” But by announcing such unequivocal conclusions without going through the accepted process, one can argue he has committed the same error that he accuses others of doing. 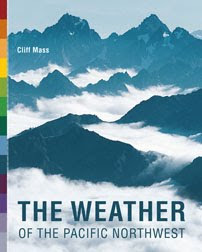 It is clear to me that many of the climate change skeptics who frequent this blog regard Dr. Mass as a kindred spirit even though Dr. Mass said global warming is a profound threat to mankind. Yesterday, I heard Dr. Mass describe on the radio the anticipated precipitation effects of global warming in the Pacific Northwest. Those who cite his statements about the cause of the Camp Fire often do not include his other stated views on global warming. So for all of these reasons, to me, it is not responsible for a scientist who is part of an institution like the University of Washington to make such unequivocal statements about the causes of the Camp Fire without more detailed analysis. While these kind of public pronouncements may appeal to some, I fear it does great damage to his reputation in the scientific community and he invites himself to be used and cited by others in a way that is not appropriate. CA's wildfires were much bigger before the 1900s. The average maximum summer temperature for neighboring Chico is 94.2 F . The average maximum temperature for October is 79.4 F and for November it’s 64.8 F. The day the Camp fire started maximum temperature was 72° but the fire started about 6:30 AM when temperatures were about 39°. Thus the fire started when temperatures were about 50F BELOW summer max. But this should not be a surprise as many fires, especially those ignited by humans, start when temperatures are cool. Fires were frequent and large during the Little Ice Age despite no contribution from climate change. The issue is always fire WEATHER! It seems very naive to make the sweeping claim the fire was exacerbated by 2F of climate change when to ignite dry paper temperatures of 425 are needed. They concluded "We find that the warming may have slightly exacerbated some extreme events (including the 2013–2014 drought and the 1976–1977 drought of record), but the effect is modest; instead, these drought events are mainly the result of variability in precipitation." They also noted, "daily minimum T (Tmin) has statistically significant increasing trends in both winter and nonwinter seasons, while daily maximum T (Tmax) shows no trend in either season." I'm with MAC - whether intentional or not, the impression left by the post is that global warming had nothing to do with the Camp Fire. Even if it made it only 1% worse or 1% more likely to occur than it would have been otherwise, it's really important to acknowledge that possibility and realize: it's going to get worse. That message gets buried, and it seems like a lot of people reading this blog are hearing: "Global warming isn't real." That's an extremely dangerous message for people to take from these blog posts. MAC says, "It is extremely difficult for me to understand how such sweeping statements could reasonably be made even before the event was complete "
Clearly MAc you fail to understand the dynamics of wildfire. Cmon! Nobody tried to contain fires before 1900. Apples to oranges. Thanks for getting the point. Cdixon, says "it seems like a lot of people reading this blog are hearing: "Global warming isn't real." That's an extremely dangerous message for people to take from these blog posts." Your argument perfectly illustrates the anti-science argument you and others are pushing. You are so vested in a belief that catastrophic global warming is happening without question, you deny any and all evidence that might threaten that belief or stimulate skeptical and critical thinking. The evidence presented here by Cliff ONLY shows that the wildfires are not caused or exacerbated by CO2 . The greenhouse effect is still real. The debate about how sensitive our climate is to CO2 is still real. Understanding the greenhouse effect doesnt depend on having every catastrophe blamed on CO2. That's stupid! I must have missed it - did someone try to compare modern wildfires to those before 1900? I think the idea is that a period of higher temperatures causes the fuel load to be extra dry. I've started a campfire at 6:00 AM when it's cold out and 6:00 PM when it's hot, doesn't seem to make any difference. If the wood is dry enough it burns. Also, I'm not insisting that the record warmth had anything to do with California's three biggest modern (clarifying for Placeholder) wildfires. Could just be a coincidence. It's worth taking a look at, though, .....is there a pattern? Note: No warming trend for Butte County (Paradise, Ca) for the month of November, but there is a warming trend for at least the 6 months prior/ + 0.2 F/decade. And those six months were, it turns out, the 5th warmest and 3rd driest on record. Again, not insisting it mattered, but worth considering. July, 2018 was the #1 warmest July ever recorded for Shasta County, CA. From Wiki: "The Tubbs Fire was the second most destructive wildfire in California history, burning parts of Napa, Sonoma, and Lake counties in Northern California during October 2017, and affecting the city of Santa Rosa the most. It is now second after the Camp Fire of 2018. It was one of more than a dozen large fires that broke out in early October and were simultaneously burning in eight Northern California counties in what was called the "Northern California firestorm." By the time of its containment on October 31, the fire was estimated to have burned 36,810 acres (149 km2), and at least 22 people had been killed in Sonoma County by the fire." The six month period, May-October, 2017, was the #1 warmest "summer" season ever recorded for Sonoma County. Snape, you say you are not insisting LOL. However you keep pushing “record” temperatures (by 0.1 C) that are irrelevant to the fire, but never discuss the all the other factors. Indeed the narrative pushed by climate change alarmists is that higher temperatures create drier fuels and drier fuels are more easily burnt. That simplistic narrative is true but often meaningless. There are many reasons why your insistence of promoting “record temperatures” is meaningless and only obscures the dialogue needed to promote public wildfire safety. 1. 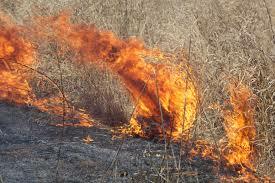 The fine fuels, like dead grasses which are essential to feed larger fires, become highly flammable in a matter of hours - no matter if weeks or months before there were record warm or cold temperatures. Fire WEATHER is the critical metric, NOT climate. 2. Most dead fuels become highly flammable when fuel moisture is reduced to 20-30%. A typical California summer drought can reduce larger 1000-hour fuels to approach ZERO percent by July through October! 3. As fuels approach 0% moisture content during California’s natural summer drought, higher temperatures or reduced relative humidity have no significant effect on fire behavior! 4. Due to volatile oils, live evergreens and chaparral leaves are flammable despite having 100% fuel moisture. Warmer or drier atmospheric conditions are meaningless to their flammability! 5. Although temperature is an important factor, relative humidity must be considered. 6. Fuel moisture after fire ignition is generally meaningless regard fire spread because the heat of the advancing fire dries out fuels 2 inches to 2 feet in front of the flames. Winds are more important and a warming world will reduce the off-shore Diablo and Santa Anna winds driving California's disastrous fires! 7. Fire ignitions of fine fuels require temperatures above 450F. On the high end, lightning strikes ignite vegetation with temperatures of 1,000-50,000F. On the low end, the lit end of discarded cigarettes are measured at 750F. A 2F increase of ambient temperature due to global warming, whether natural or anthropogenic, do not make ignitions more likely! 8. The key temperature variable used to determine the issuance of wildfire red flag warnings is maximum temperature. In the Sierra Nevada there is no trend in maximum temperatures. Additionally two-thirds of California have experienced cooling maximum temperatures since the 1930s. "However you keep pushing “record” temperatures (by 0.1 C) that are irrelevant to the fire,"
I'm not interested in a discussion if you intend to misrepresent what I write. And I'm not "pushing" temperature records. I've been taking a look at California's biggest fires, out of curiosity, and FINDING record high temperatures for the months of, or leading up to those fires. "In the Sierra Nevada there is no trend in maximum temperatures. Additionally two-thirds of California have experienced cooling maximum temperatures since the 1930s." Hmmm..... well, I couldn't find trends for the whole range, so I settled on Tuolumne County, which includes the northern 1/2 of Yosemite. The point is that, when your cult talks about the largest California wildfires in history, you're blatantly lying. But hey, any blatant lie for the cause, right? Jim Steele- I'm not advancing an "anti-science argument." Merely pointing out that it's way too early to conclude that global warming was not a significant factor in the Camp Fire and suggesting that other scientists might not see it that way is pro-science. I also didn't say: "No other factors played a role." I stand by what I said: when Cliff Mass posts stuff like this, it gets heard as "Global warming isn't real." That's a dangerous message for people to hear, because fires aside, almost all scientists agree that the world is getting hotter very rapidly due to concentrations of CO2. It makes me wonder why Mass bothers posting at all about the causes of forest fires. Arguing over attribution is like criticizing the china patterns on the Titanic after you've hit the iceberg. And debating forestry practices is a dodge, in the same way it would have been a distraction for someone on the Titanic to argue the real problem was the lack of iceberg-bombing runs over the North Atlantic. Sure, I suppose that might have headed things off, but you're still on a ship taking on water. That's a fact even your Only Scientist in the World supposedly agrees on. Yes, there is science behind both sides of the argument. The counter argument is that California's Climate Engineering Programs (aka Solar Radiation Management) injecting aerosols of the toxic pollutant coal fly ash with other earth metals to reflect the sun's rays back toward outer space, is the real cause behind the "aridity" and rise in air temperature that is claimed as Global Climate Change. 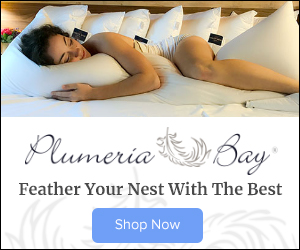 "These are the 20 largest wildfires in California since 1932 (when accurate records started to be kept), according to the California Department of Forestry and Fire Protection (CAL FIRE)." "According to Wikipedia, the largest modern wildfire in California history (since 1932) was this year's Mendocino Complex...."
I was sloppy later and did not clarify, but was not trying to deceive anyone. With due respect, I think you have it backwards. Communities at risk from wildfires need to address the clear and present dangers, i.e. overgrown brush, inadequate warning systems, and not get distracted by a long term threat like global warming (which they have little control over anyway). That was Cliff's message, and it's good one. Almost all scientists? Would that be a kinder 'n gentler way of trying to float the cult's 97% consensus lie? Look, I don't happen to agree with Mass about global warming, but I appreciate his willingness to stick closely to what he views as facts, and logic emanating therefrom. So I respect him, and if he ever writes a book about the AGW hypothesis I will read it and take it seriously. What I do not take seriously is the alarmist cult and its lies, not to mention the rampant attacks against anyone who disputes your dogma. By the way, it's two strikes against your stupid carbon tax. Want to try a third time? Because characterizing my statement that we should not rush to judgment as being equivalent to a “blind acceptance” that the Camp Fire was caused by global warming is such a clear non-sequitur, I began to wonder what was the basis for Mr. Steele’s expertise. As nearly as I can determine, he has a master’s degree in Biology and had a non-professorial appointment at a San Francisco State University extension program, where he was the director of a field station to provide field experience and education to members of the public and other persons interested in local conservation matters. While this SFSU extension learning program appears to a worthy public service activity, as nearly as I can determine those activities, nor anything else that I could identify, would constitute what is generally regarded as engaging in scientific research. Mr. Steele spends quite a lot of time denigrating those with whom he disagrees, including well-known and established researchers. This has included making demands to at least one respected scientific journal, the Bulletin of the American Meteorological Society, that a paper be retracted (which was not granted). Mr. Steele’s primary publication activity has been authoring a 2013 book in which in expresses deep skepticism, if not outright hostility, to much of the international scientific community’s research on global warming and its effects. The book broadly criticizes accepted research as faulty science using bad models. At the core of his position is his assertion that somehow global warming research has been at odds with conservation. In science, credentials are important, not so much because they provide a doorway into making a living in research, but more importantly that they are a reflection of one’s qualifications and abilities. Those qualifications and abilities necessarily including having earned a doctorate in a relevant field together with a track record of research favorably recognized by institutional colleagues and peers in the field. In all of these respects, Mr. Steele simply does not achieve that standard even though he attempts to create a different impression. MAC you confuse weather and climate. The dryness fine fuels that determine whether a spark will ignite the forest surface fuels dry out in a day. That dryness is a weather event INDEPENDENT of climate change. Combined with the surface fuels the spread of California's fire are determined primarily by the wind conditions which again are weather events, and if climate change has any impact then it would be to lessen the intensity of those Diablo and Santa Anna winds. People should be more concerned with the dishonesty of climate scientists like Kevin Trenberth or Governor Brown who propagandizes that fire season has been getting longer due to climate change. They create false narratives charaterizing weather events as climate change. the Great Basin and a trough along the southern California coast. This flow descends the coastal slopes of the mountain ranges where the air is heated adiabatically. Winds may be 40 to 60 mph with gusts sometimes to 100. Temperatures frequently are mild even in mid-winter, and humidities may be less than 1 percent. Peak Santa Ana occurrence is in November and a secondary peak is found in March." MAC wrote: "In science, credentials are important, not so much because they provide a doorway into making a living in research, but more importantly that they are a reflection of one’s qualifications and abilities. Those qualifications and abilities necessarily including having earned a doctorate in a relevant field together with a track record of research favorably recognized by institutional colleagues and peers in the field"
By so stating, MAC has demonstrated a profound misunderstanding of the purpose, methods, and qualifications necessary to do good science. As an obvious refutation of his claim, I give you Emily Rosa, now famous originator of the well done scientific research project, fully peer reviewed and published in the prestigious New England Journal of Medicine. She designed the experiment at age 8, performed it at age 9 and wrote it up as a 4th grade science fair experiment. At age 11, it was published in JAMA. Refuting any scientific research study only requires one good set of contradictory observations. ONE. Refuting "the consensus" likewise only requires one correct refuting observation. In my lifetime, "the consensus" in geology was demonstrated to be profoundly incorrect. I was in high school; my best friend's uncle couldn't get his research published because it went against "the consensus." Years went by before the tide turned; now his view is mainstream and the past forgotten. His scurrilous, "denier" view? Continental Drift aka Plate Tectonics. In the early 1970's that was still anathema to the majority. MAC in Bellingham, while you are busy playing a game of academic gotcha with Cliff Mass and with Jim Steele, oil refineries in Ferndale, Anacortes, Tacoma, and Cherry Point are busy producing thousands of barrels of gasoline, diesel, and jet fuel each and every day. While you are busily engaged in questioning the motives and the academic credentials of Cliff Mass and of Jim Steele, Boeing factories in Renton and in Everett are busily producing jet airliners which spread millions of tons of carbon dioxide around the planet each and every day. Out there in the real world, no one in either Washington State or in America as a whole is being asked to make real personal sacrifice in the name of fighting climate change. And since no one who lives and works in the real world is being asked to make real personal sacrifice, the average person has no incentive to begin questioning the conclusions of mainstream climate science. It is for this reason that informed debate over the validity of today's climate science happens mostly in the backwater recesses of the Internet. How would this situation change in Washington State if, for example, Governor Jay Inslee and Attorney General Bob Ferguson -- after wrestling with their deeper moral convictions -- decided that as a matter of principle in taking the moral high ground, production of jet airliners and of refined petroleum products in our state should be slowly curtailed and eventually shut down? Nationally, how would this situation change if the Democrat who replaces Donald Trump in 2021 decided to use the full authority of the Clean Air Act, plus the president's existing national security authorities, to pursue a goal of reaching an 80% reduction in America's GHG emissions by 2050? Jet airliners of the kind Boeing now manufactures in Renton and in Everett cannot be allowed to operate in the GHG-reduced world of 2050. Nor can oil refineries of the kind now located in Ferndale, Anacortes, Tacoma, and Cherry Point be allowed to produce the volume of carbon fuels they now do. Here in Washington State, the governor and the attorney general cannot simply order Boeing's manufacturing operations to cease and the state's oil refineries to shut down. Forcing the slow curtailment and eventual shutdown of these industrial operations can only be done by making the regulatory climate in Washington State so inhospitable to doing business here that Boeing and the oil companies would leave of their own accord. At the national level, if the new president in 2021 takes up where President Obama left off in 2011, the EPA would publish a CAA Section 108 Endangerment Finding for carbon, then establish a NAAQS for carbon, and then publish a fully-comprehensive regulatory framework for carbon which covers all major sources of American GHG's. Assuming the EPA's anti-carbon regulatory program were to be successfully defended in the courts -- and there is no reason to believe it couldn't be, given that the necessary legal precedents are already in place -- an exceptionally aggressive anti-carbon framework can be fully operative by early 2025. This leaves twenty-five years of diligent anti-carbon government action to reach the targeted 80% reduction by 2050 goal. Compressing a hundred years of technical and economic transition into just twenty-five years can't be done without significant collateral impacts. If the new president does in 2021 what 350.org was recommending President Obama do in 2011, these impacts will begin to be felt in about 2025 and will begin to grow quickly more pervasive as the decade progresses. At some point late in the next decade, the average American would have great incentive to begin questioning the conclusions of mainstream climate science. A truly robust national debate over the science of climate change would then begin, replacing the largely inconsequential debates we are having today in the year 2018. Snape I gave you a link to Mao 2015 who stated NO trend in maximum temperatures. Did you not bother to read it. Need I repeat that most Fire Weather indexes use midday maximum temperatures to determine fire danger? cdixon says "when Cliff Mass posts stuff like this, it gets heard as "Global warming isn't real." It only gets heard as "global warming isnt real" by those who have such a fragile hold on the science that they think if every catastrophe isnt due to rising CO2 then the greenhouse effect is not real. MAC tries to slander saying "I have seen no evidence that Mr Steele: has had a professorial level appointment within any research University academic department; "
When the Dean of the College of Science and Engineering at SFSU who was also serving as the President of the California Academy of Sciences appoints me to DIrector of the Sierra Nevada Field Campus, how do you twist that into no professorial level appointment?? Jim - stop willfully misrepresenting my statements. I did not say the Camp Fire was "caused" by global warming. The more you fail to engage with the entirety of the comments I'm posting, the more you come off as a troll. Sorry, "skeptic." I don't need every catastrophe to be due to rising CO2 to believe in the greenhouse effect. I get how science and attribution work. That's why I'm saying it is waaaaaay too early to make sweeping statements like "global warming is not a significant factor." The broader point I'm trying to make is that terms like "significant" mean different things in scientific and practical terms. A scientist might say: statistically, fire always happened, its proximate causes are a-b-c, ergo of all the factors, you can't prove the warmer temperature (which could still be within the range of natural variability, blah blah blah) was a significant cause or factor. OK, fine. Significant in practical terms is this: of all the signals that could be present in the fire, one of them is growing and - even Cliff Mass agrees - that growing signal will threaten to wreak massive planetary havoc in the future. Why then does Cliff Mass talk about it at all? How is it helpful? We have a short-term problem of fire management, sure. We have a long-term problem that is infinitely more critical. Does any of the dialogue on this page help us move towards a solution for that, or does it distract from it? Anyway, go ahead and distort what I'm saying...again. You come across as self-important and a very bad listener. Lecture me, tell me I'm stupid. If it helps you be more open-minded and read more carefully, I'll make this offer: when we (eventually) clamp down on carbon (probably after it's way too late), I'll grant you a special exemption so you can keep driving your winnebago around and firing up a gas-powered generator to run your laptop and condescend to people on the internet until you die. We'll even give you a badge you can show everyone that says you have a masters degree and are really, really special. cdixon attacks with "Jim - stop willfully misrepresenting my statements. I did not say the Camp Fire was "caused" by global warming. " Then he goes on a snarjy rant imagining me in a winnebago. But I never aid cdixon did. He's not a good reader and likes to make things up. Please cdixon quote exactly what I said that distorts your views. I have argued the fires were caused by human ignitions and to quote my partial reply to you I said "The evidence presented here by Cliff ONLY shows that the wildfires are not caused or exacerbated by CO2 ." If you sincerely answer the following 4 questions with evidence and logic I'll concede you understand the science of wildfires better than I suspect. Deal? 1. If surface fuels like dead grasses and twigs, which are the first to ignite and generate the needed heat to ignite trees and houses, and because those fine fuels can completely dry out in one day, why is their dryness related to climate change and not just fire weathe that has happened for millennia? 2. When building a campfire, do you first hold a match to a log , or do you first ignite the kindling, the fine fuels, and generate enough heat to ignite larger fuels? 3. Why do we need to wait to understand what has been known by fire ecologists for decades or more? 4. FInally it is the offshore winds like the Diablo and Santa Anna winds that turn small blazes into firestorms. It is the growing cold in September , November and December that increases the Great Basin High that drives the winds toward the coast. SAnta Annas peak in December. DOD studies have pointed this out since the 1950s. They have pointed out that southern California has had year round fires forever due to these cold temperature winds, long before climate alarmists' BS claim year round fires are due to climate change. So shouldn't warming, whether natural or anthropogenic, warn the Great Basin and reduce the pressure gradient and thus reduce those winds and fire danger? area shows no trend for T-max?" "Here is a graph of USHCN maximum temperatures for Yosemite. Seems to tell a very different story than your list of temperatures"
Same basic story, Jim, other than the graph you show is specific to Yosemite headquarters, and not current (only through 2013). Both are NOAA products. 2014 was the warmest year on record for Tuolumne County, and 2014-2017 was, by far, the warmest 4 year period. When you make a claim about temperature trends, like, "no warming trend", please be specific, and include beginning and end dates. "And here is an illustration showing 2/3 of California's maximum temperatures have been cooling when the decades 1900-1939 are compared to 1970-2007"
"Additionally two-thirds of California have experienced cooling maximum temperatures since the 1930s." A lot of warming has occurred in the last decade, right? Why not compare 1900-1939 to 1980-2017 instead? Would an up-to-date analysis give the same result?? Obviously not.....so were you being deceptive or just sloppy? MAC in Bellingham said... "In science, credentials are important, not so much because they provide a doorway into making a living in research, but more importantly that they are a reflection of one’s qualifications and abilities. Those qualifications and abilities necessarily including having earned a doctorate in a relevant field together with a track record of research favorably recognized by institutional colleagues and peers in the field." I am an emeritus faculty member from the University of Washington. Before I retired, I participated in weekly research seminars for almost 25 years. These were offered by PhD candidates, tenure-track faculty, as well as lay persons. Some of the lay people who did not have a PhD were employed by Microsoft as well as other high-tech companies. I can assure you that their lack of a PhD did in no way diminish the quality of their research. After retirement I became involved in trying to improve the health of Puget Sound. One of the issues negatively impacting Puget Sound is plastics - from PV tubes and plastic nets used by industrial aquaculture to micro- and nano-plastics created by the action of water, wind and the sun. I became acquainted with the work of Captain Charles Moore and his pioneering work regarding the "The Great Pacific Garbage Patch". In 1999, he created a statistically designed sampling protocol to determine just how much of civilizations’ unrecoverable waste was in this area known as the North Pacific Subtropical Gyre. He has authored (or co-authored) numerous articles in peer-reviewed journals (see: http://www.captain-charles-moore.org/publications/). Captain Moore is NOT a PhD. Mac, having a PhD is NOT a prerequisite for being intelligent, understanding complex issues, and sharing that understanding with others. "We find that irrigation has a large impact on temperature extremes, with a particularly strong cooling effect during the hottest day of the year...."
Rapacciuolo's graph, the decrease in T-max (1900-1939 - 1970-2007) was most pronounced in the San Joaquin Valley - California's breadbasket. Jim Steele - I'm not playing the "Quote me to prove to me how badly I mis-characterized you" game. You know what you said. If you want to pretend you weren't being dishonest, I'm not going to waste my breath arguing with you, because you'll just argue with me and lie again. And you do not get to dictate to me what questions I have to answer. There's only one question that interests me: how do we blunt the future effects of further warming? That's a question that doesn't interest you, and hey - I get it. You're 67. You can't be bothered. All you care about is: how do I keep the smoke out of my eyes and keep gas prices down for the next 15, 20 years? Or maybe: how do I get to make myself feel superior to stupid internet commenters? See, I'm not like you. I know that in this vast universe, so far as we know, there is a lifeless void stretching for light years in every direction. But somehow, miraculously, on one rock in that inky blackness, a thin - infinitesimal really - cushion formed, and within that cushion, life, and within that life, in just the blink of an eye - civilization. And that civilization developed science, and scientists have said: too much CO2 will disrupt the stability that allowed civilization to form. That life - and all life really, from the polar bears to the pikas to penguins and puffins and pandas to everything else in between - is worth preserving. So I don't really care whether global warming was 0% to blame for the Camp Fire or 25% to blame. The precise number is an insignificant detail, and so I wonder why someone with Cliff Mass's knowledge bothers to dedicate time to arguing over what that percentage is. He could talk about so much more important things. He could address the dangerous hypocrisy of the president in dismissing climate change altogether and remind everyone: it is real, and it will get worse. He could talk about the recent report that CO2 emissions hit a new record high in 2018 and what technologies are impactful enough to counteract that trend. No, he - like you - dedicates himself to debating the precise cause of today's extreme events and protecting us all from the HORROR of mis-attribution. What a crime! It might be accurate (though other scientists would likely disagree with the over-simplification of his argument and would dismiss you as a crank with a keyboard, which is why you have to self-publish and harangue laymen on the internet), but it is definitely a waste of precious time - time that life on this planet probably doesn't have. Oh no, am I being alarmist? Boo hoo. Alarm is the correct emotion at this juncture in history. And not sanctimony and argumentativeness masquerading as skepticism. cdixon rants . "See, I'm not like you." Youre Emotional unsubstantiated rants compared to my scientific and evidence based arguments. Snape says ""I didn't have the patience to dig through the study you linked." Clearly Snape you have the patience to search for less convincing data and you pick and choose what suits your argument. Look, sounds like you've done some interesting research into local ecology, and those factors are certainly important - all human impact has to be curtailed in a major way; but CO2 and methane are the biggest and most global of the impacts we as a species are a driving. It's a fool's errand to spend so much time debating the magnitude of the signal left (or not) by global warming in the Carr Fire. It is a waste of your rational powers, such as they are. On the plus side, maybe all the hot air you're blowing out of Pacifica will counteract the cold devil winds blowing down the Sierras. Pressure gradient, you've met your match in the egocentric howling from a little city by the sea. This is just puffery - it makes you feel good to position yourself as the know-it-all, but it's a petty distraction. "Nice" chatting with you. Echoing what Dr. Mass has also described as global warming’s “profoundly serious threat to mankind,” this research deals with a substantial threat to life on our planet. The study’s lead author has said "[t]his study highlights the potential for a mass extinction arising from a similar mechanism under anthropogenic climate change." This type of research is representative of the collective body of global warming research that has been ongoing for at least 20 years. It is conducted collaboratively among skilled and recognized researchers at major institutions throughout the world. The Seattle Times reports that use of a supercomputer over a period of 6 months was needed to carry out the complex calculations, modeling and simulations needed to carry out the study. So, why do I bring this up here? I suspect a number of readers and contributors to this blog will find a way to reject or discount this research. I bring it up because it illustrates what is needed to call yourself a qualified scientist in this field. Doing this work requires more than self-publishing a book and selling it on Amazon. Mr. Steele’s primary thesis seems to be that global warming researchers are using faulty science and bad models for their own selfish purposes and that the entire process has been hijacked and politicized. In addition, he feels that somehow all of this has been at the expense of natural conservation efforts. His alternative explanation for the widely-accepted conclusion that global warming is being caused by human activity that introduces greenhouse gases into the atmosphere is: (i) recently observed global warming is the product of normal climate variation, and (ii) many such observations are the result of faulty research. While Mr. Steele is not alone in these kinds of beliefs, his positions and conclusions have close to non-existent support in the scientific community. So, while Mr. Steele calls himself a climate skeptic, I call myself a Jim Steele skeptic. 1) " I can assure you that their lack of a PhD did in no way diminish the quality of their research." The only way anyone can be assured by this statement is that you yourself have a Phd in making that assessment, i.e. that you or another Phd supervised their work and checked it for validity, knowing full well that they have not sufficiently demonstrated an ability to provide unsupervised work. 2) "Mac, having a PhD is NOT a prerequisite for being intelligent, understanding complex issues, and sharing that understanding with others." Being intelligent, understanding complexity and sharing are only peripherally important for competently practicing a skill. I really don't care if a jet airplane pilot is intelligent, understands complexity or is good at sharing. I only care - in fact I demand - that he / she is functionally skilled and demonstrably practiced. Because I am not a pilot myself, I have no means to judge validity by observing their practice or listening to their speech. I need to know if this character has a Phd in Jet Aircraft Pilotology. Very few people, including Phd's are actually familiar with the parameters and requirements for competent skill acquisition. Competent being the measure of reliability. So don't blame anyone for demanding a proof of certification. Jim Steele does in fact need to further elaborate on exactly what his practice has been and the levels of certification required for that practice, particularly considering that he has never published any peer reviewed research in his purported skill domain. "Clearly Snape you have the patience to search for less convincing data....."
Fair point (not sure about the "less convincing" part, lol), so I read the Mao paper. Their evidence matches very well with Climate at a Glance. Not surprising since it probably comes from the same source, NOAA - although they never actually specified. Tuolumne County, as I guessed, seems to be a good sample for the Sierras. They analyzed the time period 1920 - 2014, and found a warming trend for daily minima but not maxima....check. They stated a more significant warming trend starting around 1950....check. It is very easy to determine who has the requisite knowledge and understanding and who does not. When ever a person lacking in knowledge is faced with facts they cannot refute, they always descend in lowlife shoot the messenger tactics and fabricate false narratives. The report has received considerable coverage, including in The Seattle Times and Washington Post. One of the more noteworthy aspects of the 2017 report is, like the 2016 report, the scientists who studied a number of these events had an extremely high level of confidence that a number of the events can be specifically attributed to human-caused climate change. Prior to 2016, the discussion of human-caused climate change tended to look at general increase in probabilities of events and overall effects rather than ascribing a particular severe event to human-caused climate change. One of the events (record fires in Australia) was not seen as specifically linked to human-caused climate change. Overall, approximately 70 percent of the 146 research findings identified a major link between the event and climate change and 30 percent did not. Included in the report were studies of the 2017 US Northern Great Plains drought which was accompanied by large wildfires and caused considered economic loss. Many of the reviewed events relate to heat waves and drought and carry with them higher risk and incidence of wildfires. That may be but this all flies in the face of the esteemed Sierra Nevada Summer Camp. The report, including the excellent executive summary, describes the continuing substantial warming of the arctic air and ocean to the highest levels over the last five years since record keeping began in 1900. The rate of warming is twice that of the rest of the planet. This warming is believed to be the Arctic’s largest change in human history. The 12 lowest Arctic sea ice measurements in the satellite record have occurred in the last 12 years. More extreme weather effects are associated with the Arctic warming, including the seemingly paradoxical outbreak of bitter cold spells in the winter in subarctic regions due to changes in the jet stream. In the Arctic itself, the warming is producing harmful algal blooms. The warming is also causing loss of Arctic habitat, vegetation and animal life. The report also describes an increase in Arctic Ocean microplastics, with the Arctic Ocean having the highest concentrations compared to all other ocean basins in the world. Changes in Arctic sea ice are seen as one of the causes for the increased microplastic concentration due to various mechanisms.